Bausch & Lomb’s ReNu multi-purpose solution was the first in the world to offer an all-in-one multipurpose solution to contact lens wearers and it’s still an incredibly popular choice for soft lens wearers (including silicone hydrogel) today. At Vision Direct we stock the original ReNu Multi-Purpose Solution in both a flat pack and standard bottled size, there is no difference in the solution only to the way the bottles are packaged, if you need it to fit through your letterbox on delivery choose the flat pack. 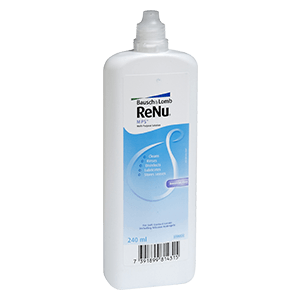 We also sell the ReNu MultiPlus Multi-Purpose Solution. If you’re going away try the ReNu MPS Multi-Purpose Flight Pack it contains two small 60ml bottles of solution, contact lens cases and a zip-lock bag perfect for travelling.